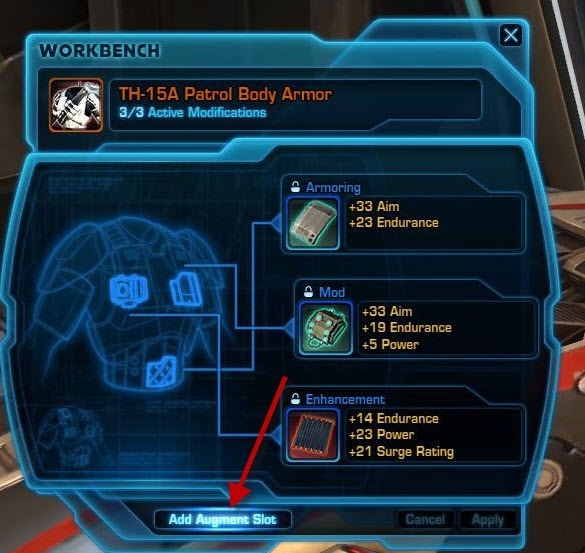 Hey everyone, I am sure you all know by now that there is a new way to add augment slots to gear in 1.3. I am going to walk you through the process currently on PTS right now so you will be well prepared once 1.3 lands on the live servers. What is happening to my current augmented gear? Your current augment slots on existing gear will remain once patch 1.3 arrives. They will be converted to the appropriate tier, depending on the item level or the level of the augment, whichever is higher. So if you have a level 20 item with a level 49 augment inserted into it, it will be converted into a MK-6 augment slot since the augment is a Level 49 and therefore MK-6. This is a good opportunity to insert whatever gear with augment slots you have with L49 augments (green ones will do) so that they all get converted to MK-6 tier. Can I still crit craft gear and get augment slots after 1.3? Yes, you still can. Be warned that the augment slot you get post-1.3 with the crit crafting will have a tier corresponding to the item level. So post 1.3, it is not really worth your time to crit craft low level gear for augment slots. 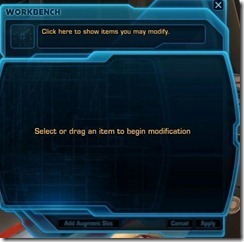 You can see that in addition to your normal crafting mats, you will need augment slot components of the appropriate tier. Keep in minding that these augment kits are tradeable. In theory, you should be able to RE any crafted item (i.e. crafted items that typically give you an augment slot when crit, not those that give you extra when crit) you crafted to get an augment slot component regardless of the quality. However, there seem to be some issues on the PTS with some crafted items not giving out components when RE’ed (i.e. War Hero Orange crafted shells were not giving out components when RE’ed). There is a thread on it. The level of the item you RE determines the tier of the augment slot component you get. Once you have the augment kit (either crafted yourself or purchased from the crafters), you can head to the item modification station. 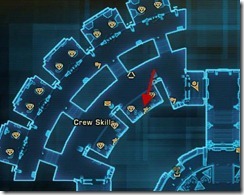 There are two stations located on the Crew Skills section of the fleet, directly opposite the crew skill trainers. 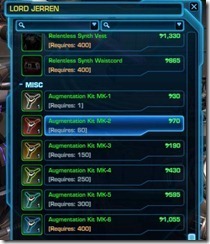 In addition to requiring the augment kit, you will also need to pay a small credit cost. 30k credits for MK-6, halved from what the devs said pre-1.3, not bad! You get your augments the same way pre-1.3, except augments are now tiered like the augment slots. You can only augments into augment slots that are of the equal or higher tier. 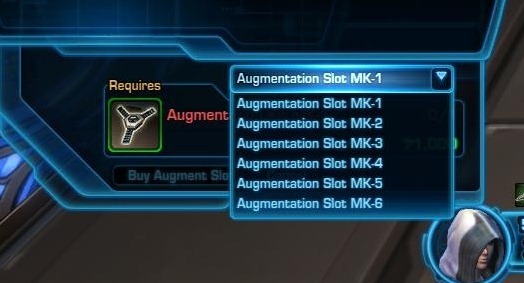 (i..e you can put a MK-5 augment into a MK-6 augment slot but you cannot put a MK-6 augment into a MK-5 augment slot). I believe when the devs said 50k for an augment slot, they had factored in the approximate market value for the crafting mats to make 10 items. I at least remember them saying something along the lines of 50k as a ballpark based on server market. Have you seen anyone who has tried to augment a matrix cube?? 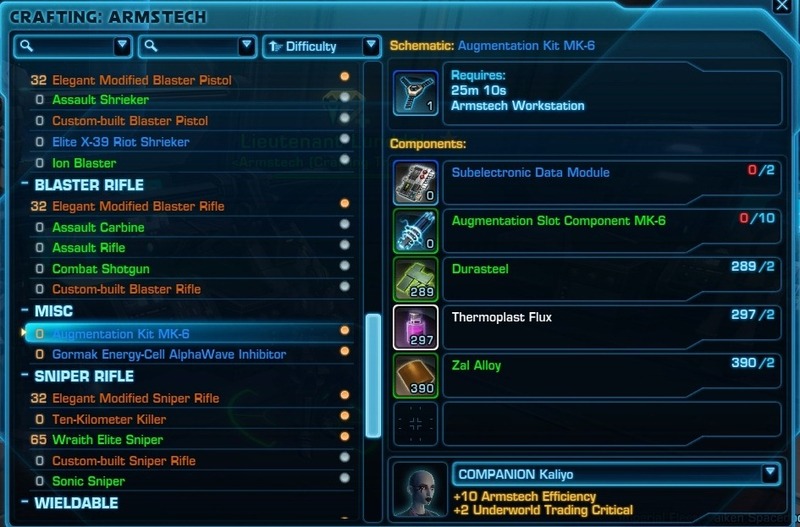 Can you confirm whether the augmentation kit can be applied to all 14 pieces of equip-able gear or only some of them? it will depend on two things – the level of the augment you inserted into it or the item’s level. 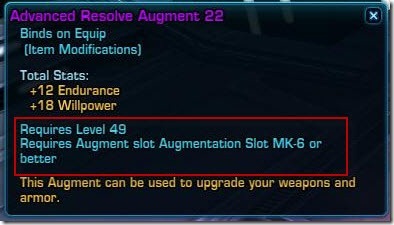 if the augment slot is empty, the augment slot on that will convert to an appropriate tier according to its item level. If the item has an augment inserted in it, it will convert to the level of the augment or the item level, whichever it is higher. So if you inserted say a green level 49 augment into a level 12 item, after patch 1.3 it will have MK-6 augment slot. Is the current augment inside destroyed, removed, etc? I’m curious cause I have custom lower level gear with level 49 purple augments and well… i don’t what to lose them! Great job with all this work! REing crafted level 47 greens gives MK-6 slot component. and yes all 14 slots can be augmented. Has it been confirmed that crit-crafted gear (that already has an augment slot) can have another augment slot added to it? 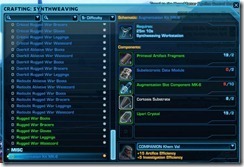 Can you verify that only crafted items can be RE’d to give the new material required to create the new augment kits? In other words am I wasting my time saving all the level 50 items I find in the hope of REing them in to a stack of the new mat after 1.3 hits? I will double check but I am pretty sure its crafted items only. can the Matrix cube be augmented? 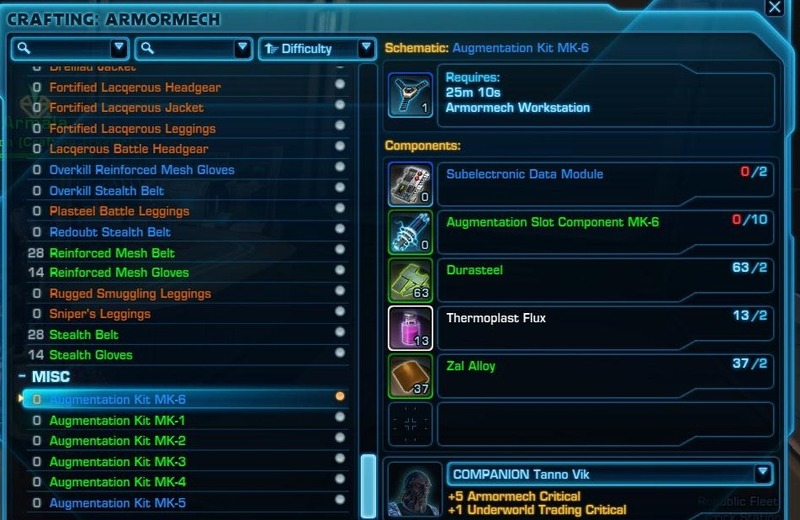 Can other clases than Armormech, Synthweaver, Armstech RE their crafted gear to gain the component to make the kit, or does it have to be one of the classes that can make the kit? Ie. can an artificer RE lightsabres/relics and get the component? 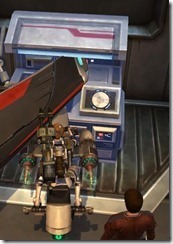 Dulfy, I seem to remember you could upgrade the augment slot with credits (so from for example, MK-4 to MK-6). Do you know how expensive that would be? 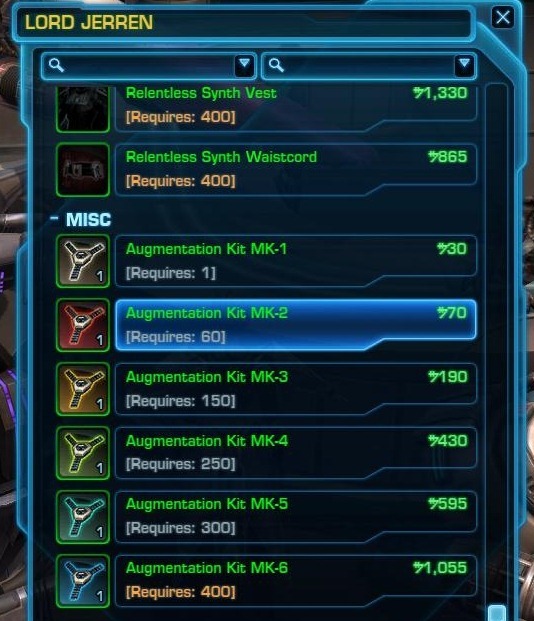 I say this because, as you posted in the other thread as well, lvl 5 and lvl 6 MK augment kits use slicing materials (the prices of which will go through the roof), whereas the lvl 4 and below augment kits do not. This means that, depending on the cost, it might be better to craft a lvl 4 kit and upgrade it to lvl 6? 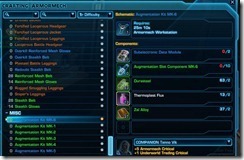 Is it possible to augment, columi, rakata, campaign gear ? PVP And PVE shields and focuses? 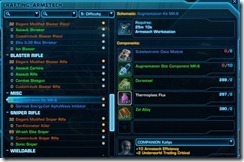 Item Modification Tables in the game world now provide players with the ability to add augmentation slots to armor (head, chest, wrists, legs, feet, waist), earpieces, implants, relics, main and off hand items (knives, shotguns, generators, shields, foci), and droid armor (sensors, cores, motors, and parts). I’ve been looking all over for the answer to this. 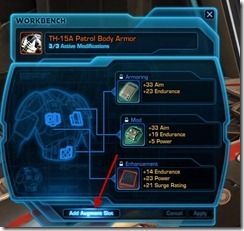 What happens to the gear you already have augmented post 1.3 will your augments be taken out and will I have to re-augment my gear? If so that’s crazy it was very pricy to pull out all those mods. Also are set bonus going to transfer or is it still just WH and Camp. only? the augment will stay in, you won’t have to re-augment your gear. There was a bug on the PTS that caused you to lose all augment slot on all gear when you copied over but won’t happen on live servers. The augment slot on the item will be converted to the appropriate tier, the higher of the item level or the augment level. So if you have L49 augment in it, the slot will be converted to MK-6! I was about to rage quit the game over that. Again you are the best at what you do thank you so so much! Hi Dulfy. Sorry to let you know but, probably due to a glitch, the information you present related to current augmented gear is not accurate. 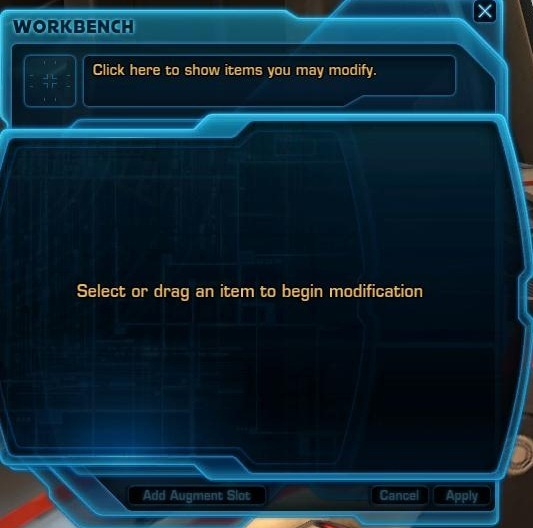 After removing augments from several pre 1.3 patch augmented items (all level 50 – rakata bracers, rakata relic etc) I can no longer apply them back (or any other lvl 6 augment). I get the error message “the augment requires a more powerful augment slot!”. I did not test exactly to see what tier is the augment in my lvl 50 items. One solution some people took was to reaply the MK-6 augment kit but I find that unacceptable. I raised a ticket with CS already. ya its a bug. I thought they were going to fix it with last night’s patch but I guess they didn’t find a fix for it yet. Hopefully it will be fixed come tuesday. So does that mean that I should sell all of that crafted augmented WH gear I’ve been saving up for when I hit valor 70 because I’ll be able to augment the WH gear I’ve purchaced with commindations? 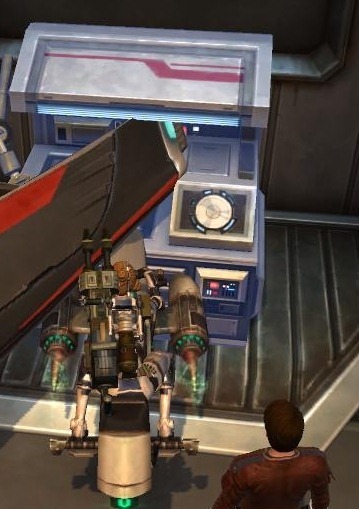 Dulfy – let me tell you, this is one of my very favorite websites for SWTOR. KUDOS to you. 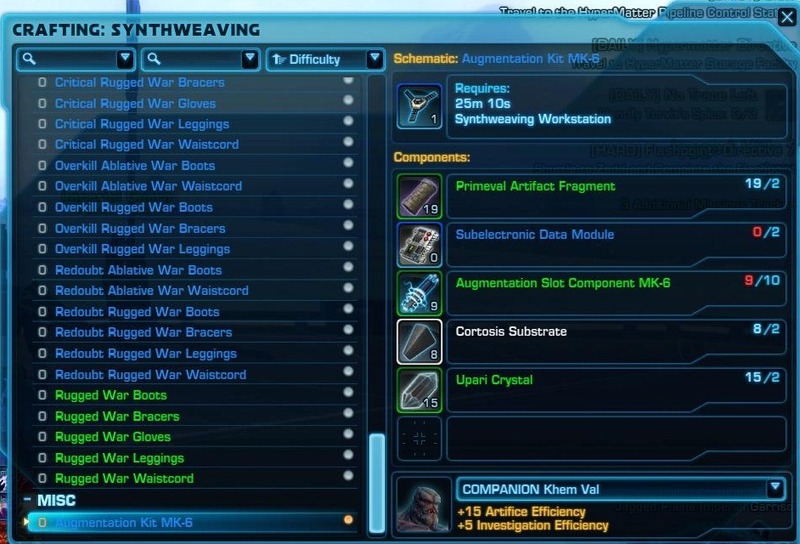 Can I get the materials for the augment slots from slicing, scavenging etc? or only via RE green, blue etc. quality gear? Has it been confirmed that crafted lvl 49 gear provides also MK-6 material when RE? I believe that items reguiering grade 6 mats will provide it.. but not confirmed..
CCan a lvl 20 orange chest somehow get a lvl 49 plus Aug in it by adding a slot post 1.3? Yesssss I will get my spec the foundry robe! Thanks for all the great info as always. The site is amazing for up to date info. I saw the PTS patch notes and it mentioned upgrading from MK6 to MK7 augment slots. Have you seen or heard of MK7 slots? Hi, I dont know if this was taken in but I ask it anyways. Is it also possible to add augment slots to the Legacy and Social gear? 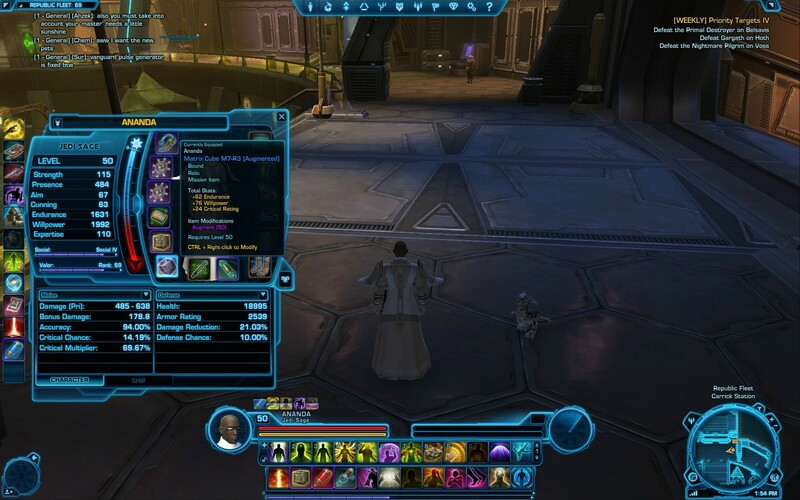 synth lv47 greens(force adept set) RE’ing to mk6 parts for me on ptr. whats the deal with that? yup I noticed that as well, not sure if it is a bug or intended. The devs said the tiers would be corresponding to the current tiers for crafting but the fact that L47 items RE to MK-6 components says otherwise. If even the matrix cube can be augmented, does this mean every orange weapon can be augmented too? plus the implants, and earpiece?? how bout the belt and wrists? yup, everything, even droid components! By The Force! (O.O) thanks for the info now i am really looking forward for it! Any tips to prepare for these augments? or just a loads of cash? level up a slicer if you don’t have one, they are going to be rich since everyone will be making augment kits once 1.3 hits and slicing components is going to be in high demand for both kits and augments. Is this still accurate? I haven’t tried it myself but I’m being told that you can’t. I heared that the only thing that couldn’t be augmented was the matrix cube, although that is of minimal importance now that the war hero relics give a passive buff of 113 power/defence/etc, making it way better then the new matrix cube. matrix cube can be augmented, least the old version could. Don’t think they would change it for the new version. How many augment materials do u receive when REing things? Do you always get aug materials when REing things? hi dulfy, quick question… i have a vibrosword that i want augmented, its bound… is there a way to get it augmented without giving up my biochem crew skill? ya just purchase an augment kit once 1.3 lands. 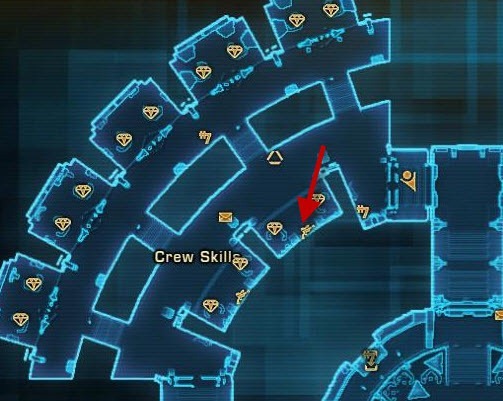 You don’t need a crew skill to add an augment kit to an item. If you craft a level 20 orange and crit an augment slot, which I assume will be MK-2 based on level, and want to upgrade it to MK-6, would the cost be 22,500? Will those of us rich, lazy players be able to just buy the kits themselves from the GTN instead of making them? How much should we expect to pay for level 49+ kits? They were 400k on the PTS but mostly cuz some people got copied multiple times and ended up with millions of credits, causing a massive inflation. Will the exalted/renowned legacy sets be able to have augment slots added to them in 1.3? So wanting to augment all 14 slots on my character, I would have to craft and RE 14 x 10 lvl 49+ items in order to get 140 augment components, since I need 10 of these for each augment kit? Right? Thx for heads up – it is no prob since I have a slicer. the problem I believe is that I have 500+ lvl 6 slicing material, and only like 1% of this is a purple material….we get WAY too many non-purple materials compared to the purple materials when slicing….that is an issue…. So that’s 30k to put the slot in…50-100k or more for the augment itself…and 100-200k for the augment kit…At least 300k for 12 endurance and 18 power on one item. Is there something I’m missing, or is this crap only useful for the people who actually have the time and patience to put 3 hours into daily missions every day? Unfortunately, it will be a very large credit sink. Keep in mind that current PvE content does not require any augment at all. However, if you plan to do PvP, you might have a tough time against opponents who are all augmented out. A lot of work….. Yes …. I have now gathered a lot of materials…. Crafted 42 augments …… Gathered more materials …. And have crafted 140 lvl 49 gear and is as such ready to RE them and craft 14 augment slot kits…. Did not add up how many credits I have spent….. Lol… But I am ready for getting augmented. If I have a level 30 chest piece will I be able to add level 49 augments to it at all? ya just add a MK-6 augment kit to it. Then you can pop in a 49 augment. If i augment my rakata gear, will i lose the setbonus? Hey Dulfy and everyone else who reads her page, wanna save some creds? Then forget about MK-6 augment kits, and buy/make MK-5! All purple grade Augments for the MK-5 slots (Advanced __________ Augment 21) only lose 1 endurance compared to the highest level augments (Advanced _________ Augment 22), and keep the +18 to the main stat! This means if you augment all 13 pieces on your character, you only lose 13 endurance, keep the main stat bonus, and save literally 10s of 1000s of credits! Just figured I would throw that out there. Enjoy! That is a good point! I personally only purchase the Q22 augments as I like the purple look and having green or blue augments kind of ruins it hehe but if you are short on credits this is a good way to save some without losing too much stats. Well I only meant the Purple level Q21 augments, the blue/green level augments for both Q22 and Q21 lose a great deal more to their respective stat bonuses. +18 Strength, + 11 Endurance. So you keep your purple look AND save credits! Been Reing things like everyone else and since no ones seems to have mentioned it , a cheaper way when reing things, I reverse Engineered Greens level 47 and higher and still got the Mk 6 Component , there a lot cheaper, less mats and take a lot less time. I am leveling an operative and I put MK-4 augments in his gear. After I level up a few levels, will I have to replace the MK-4 augment slots with MK-5 augment slots and then MK-6 later when I want to put the higher level augments in? If I have artiface, can I reverse engineer those lvl 47+ items for the comps?